Lotus is believed to reduce pitta imbalances. The lotus seeds improve speech and concentration. Mantra invoked on a lotus Malas abounds in spiritual wealth. The oval seeds of the lotus are a smooth matte brown color known for its cooling effect. It is seen as an astringent and rejuvenative, good for first Chakra issues. "I discovered the website while looking for a jalneti pot. Bought one in stainless steel, an excellent purchase. Since then I have been exploring the site and buying interesting things of good quality. The head massager, neem cream, copper tongue cleaner, acupressure slippers, and so many other things that I have bought have given me immense satisfaction. " "Very nice product and well packaged.Thank you. " "Delivery was slightly delayed, but after a quick email, order came fine and in good condition. I love my bracelet and the lotus mala is looooooong! Much longer than I expected. But I love it and have aleady gotten a couple of nice comments on the bracelet. Thank you. I will order again. " 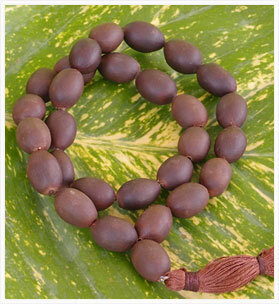 "The lotus seed mala and bracelet are well made, very attractive, and quite reasonably priced. Shipping was exceptionally quick, and customer service provided helpful communication. Thank you! "